About a week ago, I picked up a generous bag of parsnips, so be forewarned the next few days are going to be filled with lots of parsnip recipes. The first offering is this easy peasy 'Parsnip and Kale Soup'. As always the thought of making Jane Grigsons's 'Curried Parsnip Soup' did cross my mind. After all, parsnip and cumin (found in both curry powder and Garam Masala) make a wonderful partnership, or should I say parsnip-ship, but I had other culinary ideas for this combination, whereas this Parsnip soup was about simple and natural flavours. 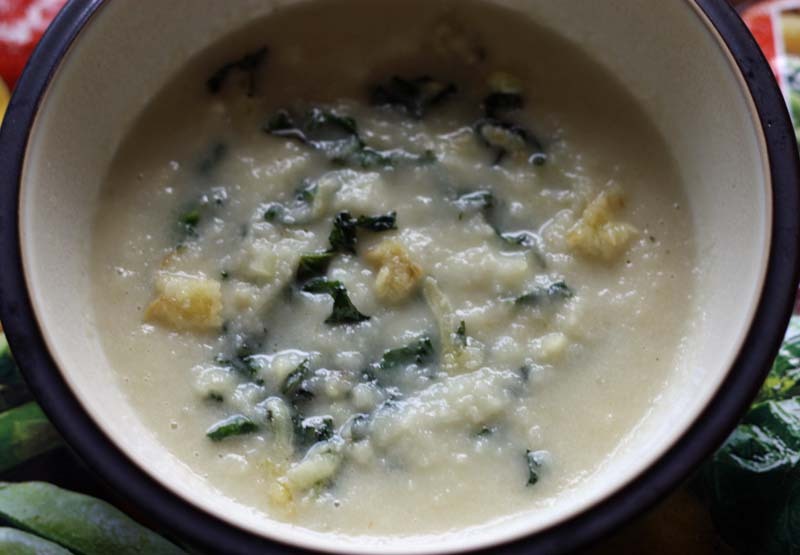 Other than salt and pepper, this Parsnip soup recipe has no spices at all. I think this sweetness of the parsnip balances wonderfully with the bitter undertones of the curly kale, that had an element of crisp about them. 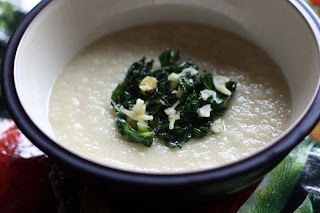 If you wish, you can omit the curly kale, but without it the soup does look rather plain. Its doesn't look quite so pretty stirred, but the flavours were good. 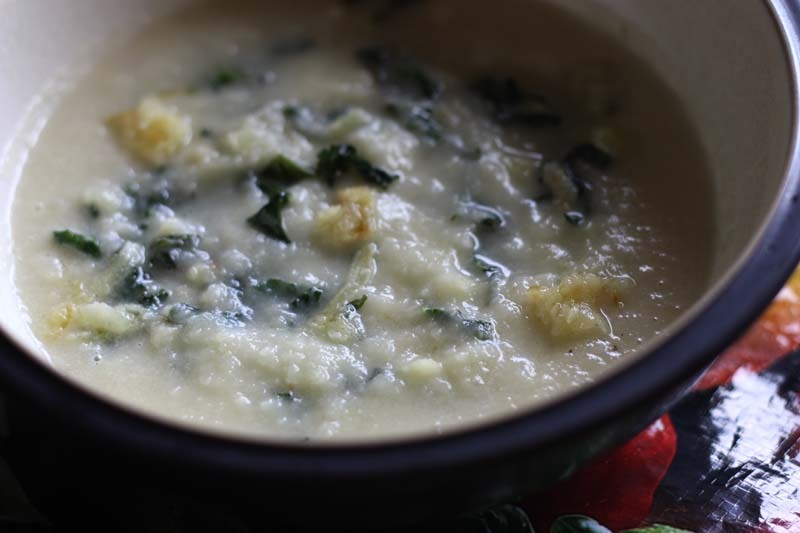 This soup is also rich and creamy making it a filling lunch. I'd also like to say Thank you for the comments on my previous post. Although things around me are a little less chaotic this week, the last few months has seen some dramatic changes in our life, more recently (a costly leaking roof and) my redundancy. These will continue to bother me as they will have impact on the way we live our lives, but right now I am trying my hardest to remain optimistic. Heat oil in large pan, add the onion and fry until soft, then add in the parsnips and garlic and fry for few minutes. Pour the vegetable stock, season and bring to the boil. Cover and simmer for 30 minutes until the vegetable are tender. Allow the soup to cool, then gently transfer to a food processor and blend until smooth. Return the pan. 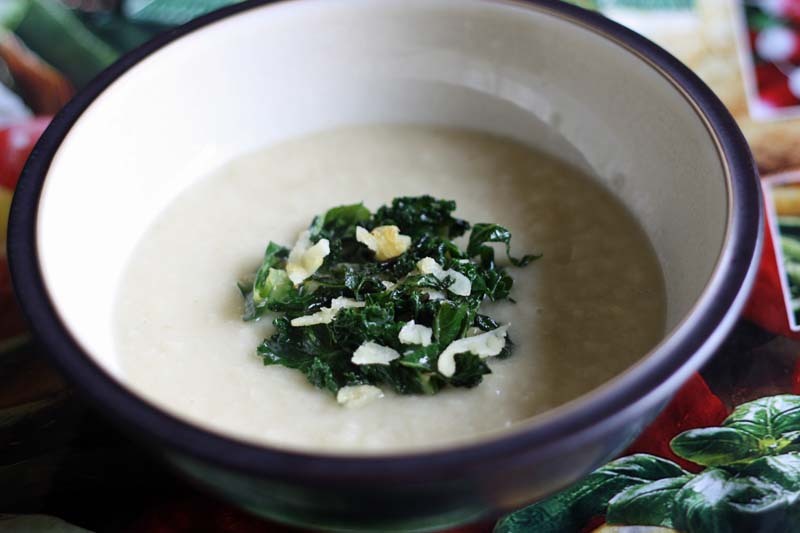 While the soup is cooling down in another pan, heat olive oil, add the kale, stir and then cover for 5 - 6 minutes, then stir in salt and pepper to taste, and continue to cook until the kale is tender, yet crisp. with the kale; or for an all in one approach, stir the kale into the soup and serve. Hi mangocheeks! I haven't stopped by here in a while but I've still been reading. I just wanted to say I LOVE your pun "parsnip-ship"! so cute. Parsnips are absolutely delicious, what a treat. However to get the fullest, richest flavour from the parsnips, they should be roasted. looks very healthy!! wanna try it myself! How nice that you still have parsnips available. Mine were all finished up very early in the year. Sorry to hear that you have had a number of issues to cope with recently. Your love of cooking will help you to bear up optimistically in a time of adversity! looks great! I love parsnips!! I am always looking for new ways to prepare parsnip as we get plenty in my organic produce deliveries throughout the winter. They aren't my favorite thing to eat so I try to find new ways of preparing them but I haven't had as much time as I would like this winter to think up recipes. Looking forward to yours! I really like kale so I'd be willing to make this parsnip dish! This looks good. I often find parsnips too sweet for my liking. But I LOVE curly cale. I bet the earthiness of the kale would balance the sweetness of parsnip. It's lovely to see you again! I missed your delicious blog while I was off traipsing around Belgium. I hope things are better where you are, and I'm sending good thoughts your way. The soup looks lovely! Parsnip is a close second to beetroot as a favourite veg of mine, so I'm really looking forward to seeing what you've done with that big bag of parsnips! Thats okay, I read fellow bloggers blogs and don't often comment. Pleased you like the pun, though I can't claim it as mine as I'm sure I read it somewhere, maybe in a food magazine a few good years ago. You'll be pleased to learn that there will be plenty more recipes to come. I have roasted some of the parsnips - come back in a few days and you'll see and hopefully like. Thank you mr. pineapple man. These were not homegrown sadly, but they were def. British grown, I would not have puchased them otherwise. Its lovely to hear from you RuckusButt. Parsnips are not my favorite root veg either, hence the reason I've been finding new ways of preparing and eating them. I do hope you find some inspiration here. Please follow this link for other parsnip recipes on my blog. I agree with you and this is the reason that I have not been that fond of parsnips, but I'm finding new ways to enjoy it - see my blog post today - spicy. Its Lovely to hear form you too :) and I hope you had a good trip in Bruges, Belgium. Also Thanks so much for the kind and good wishes being sent my way, all are being accepted graciously. I do hope you like my Parsnip offerings this week. Just an ordinary white onion.